The theme of this month’s Recipe Redux is A Trend in Every Pot – combining soup, perfect for this time of year, with at least one of ingredients from the predicted 2013 food trends. By the way, Janet Helm has a terrific summary of all of the 2013 food trends. I love soup, and you all know how much I love my slow cooker, so this was an easy one for me! 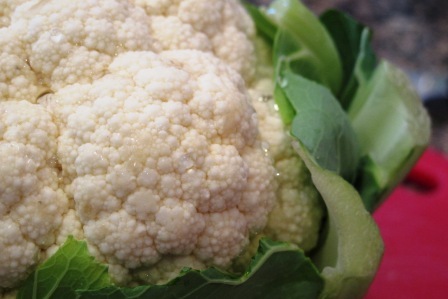 Of course cauliflower jumped out at me as I have developed a love for this vegetable over the past year. My favorite way to eat it is roasted in the oven, then add a splash of balsamic vinegar and sprinkle of Parmesan cheese. The rest of my family doesn’t quite share my enthusiasm for cauliflower, which I had dubbed white broccoli to entice my four year old. I also use the real name too so that he gets acquainted with it. Lately though, he has been refusing to eat it. Cauliflower is actually quite versatile and is often used as a substitute for mashed potatoes, and I’ve even noticed the trend of using it for a pizza crust. I’m pretty sure my family would not go for that though. 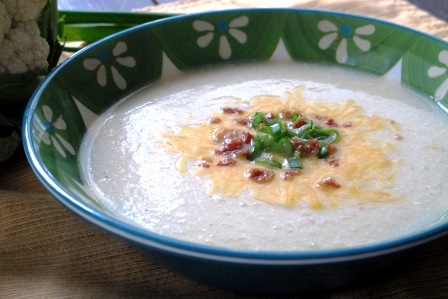 But back to potatoes, I had made a Baked Potato Soup last year that was a big hit. Naturally, I decided to play with that and remake that soup by adding cauliflower and celery root (otherwise known as celeriac). 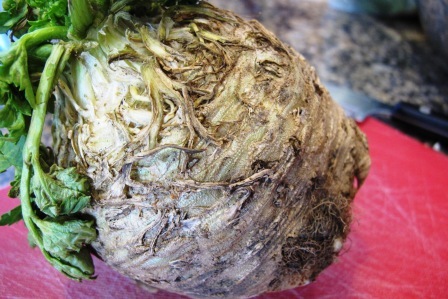 Celery root (which is, as you may have guessed, the actual root of the celery plant) is another great and versatile ingredient that can also substitute for mashed potatoes, or at least be blended in for a nice peppery tang. It does have a strong celery flavor, which I like, but if celery isn’t your thing, then either use less or just leave it out altogether and use more cauliflower. My son gave the soup a big thumbs up and resounding “Yummy,” though I suspect it also had to do with the pieces of bacon on top! 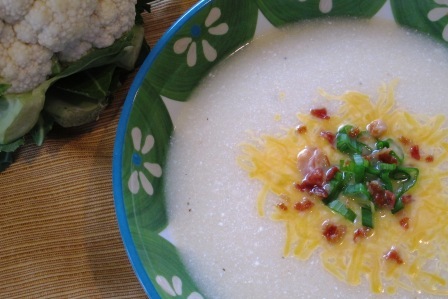 Baked Potato Soup gets a healthy makeover, boosting the flavor and nutrients with the addition of cauliflower and celery root! The result is creamy goodness sure to please the pickiest of palettes. Place the cauliflower, celery root, potatoes, onion, garlic and chicken stock in a 6 quart slow cooker. Cook on high for 3-4 hours or on low for 6-8 hours, until vegetables are tender. Using an immersion blender, puree the soup. Alternatively, puree in batches in a food processor or blender. Stir in the Greek yogurt. Season with salt and pepper to taste. Serve and offer sliced green onions, cheddar cheese and bacon crumbles as optional toppings.